These exquisite 19th century French vases have been attributed to the famed French glass manufacturer Baccarat, the maker of some of the finest pieces of glassware in history. The vases take an ovoid shape, and their bodies are crafted from smooth opaline glass. Opaline glass was extremely popular during the 19th century in France because of its translucent finish which allowed for a great range of decorations to be applied to the surface. 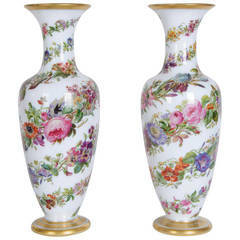 Here the vases have been adorned with intricate, detailed depictions of flowers. Their bodies are also parcel-gilt, with banding at their bases and around the top and bottom of their flared necks. Each of baluster form, with twin satyr-mask handles, decorated to both sides with bouquets and scattered sprays of flowers, the mouthes and feet with turquoise and gilt bands. 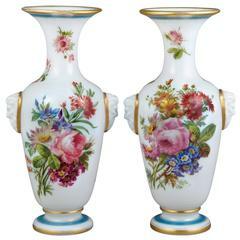 Pair of opaline glass vases by Baccarat attributed to J.F. Robert (1778-1832). Decorated in polychrome and gold with spiraling garlands of flowers.